It soon becomes clear that the Bad is being sent to the train to retrieve a map, while the Good is being sent to the train to kill the Bad and also retrieve the map. Meanwhile, the Weird is merely robbing the train; naturally, he ends up with the map and gets pursued across Manchuria. The film is set in the 1930’s, when Korea is occupied by the Japanese, who are attempting to make headway into the continent. There is a Korean Independent army involved, and when it turns out the map leads to treasure, not only do our three heroes/villains chase it, but so do the Japanese army, the Independent army, and a bunch of thieves called the Ghost Market gang. With so many factions involved the movie hardly has a chance to slow down. Even running about two hours and fifteen minutes, the film is well-paced, with hardly a dull moment. Th movie continues from the train sequence to a number of chase scenes involving people trying to obtain the map. Pretty much every one of these scenes includes gunfights, knife fights, and high-flying acrobatics. After about an hour and a half of constant chasing, the movie moves to its climax, where all the factions are racing toward a single point on horseback, jeep, truck, and motorcycle. Nothing is left out here, not even cannons, and the effect is thrilling and awe-inspiring. The Good, the Bad, the Weird borrows heavily from a number of American and Italian influences. Besides the obvious there are glimpses of films like The Treasure of the Sierra Madre, The Wild Bunch, and even Raiders of the Lost Ark. It plays like a pastiche of all these movies and more, but it does it so well that it never comes off like a cheap imitation. The fight scenes are exciting, the gunfights exhilarating, the battle scenes epic. At times the kinetic action feels like such Stephen Chow films as Kung Fu Hustle. It’s fairly violent without being over-the-top gory. Plenty of people bleed and there may be a horse or two that get blown up, but I wouldn’t want to offend PETA by mentioning it. The film is pretty hilarious at times, too. The Weird gets his full share of the laughs, especially involving certain scenes with his granny. He also keeps some dark secrets from his time in Korea, but such twists mustn’t be spoiled here. The Bad is definitely the coolest character, with an ability to dispatch nearly anyone at any time. The Good is basically a slightly greedier John Wayne. He usually does what is right, but may stray from his path a little in order to secure some money. There’s actually hardly anything wrong with the film. I had fun watching the entire thing, even though it’s a bit long. There are several endings, but each ending is entertaining and adds to the experience without slowing down the film or becoming boring. The movie looks fantastic, with amazingly crowded markets and gorgeous expanses of Manchurian wilderness. The acting is superb and director Ji-woon Kim certainly knows how to make his characters look cool. If you have the opportunity to see The Good, the Bad, the Weird on the big screen, do not pass it up. 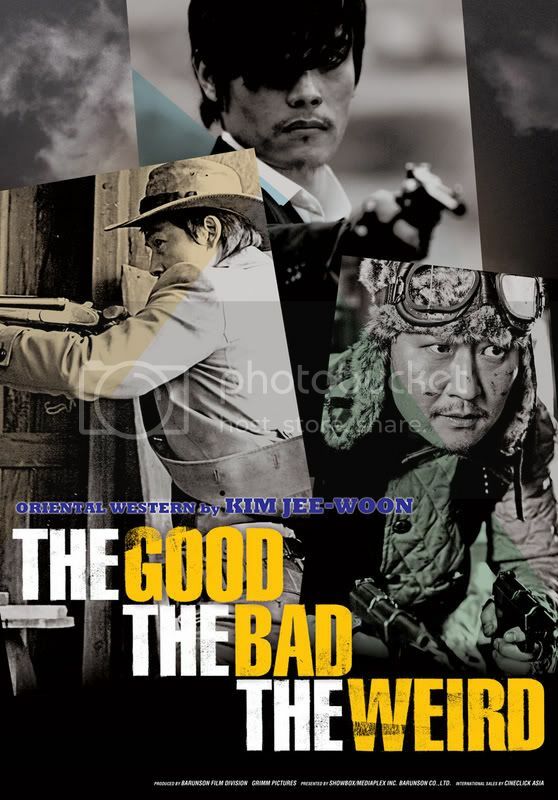 Fans of Asian cinema and neo-Westerns would do well to search it out on DVD.